Home GiveAways LoadMeNa.com Load Giveaway! People use Cell Phones as a way of fast, easy communicating. They are almost essential nowadays; most people have one in all countries around the world. They are a quicker way of communicating than letters or emails. But unlike letters and emails, cell phones needs a load for you to be able to send your text or do a call to your dear ones; unless you're using a mobile line from specific telecommunications provider like Smart and Globe to name some. 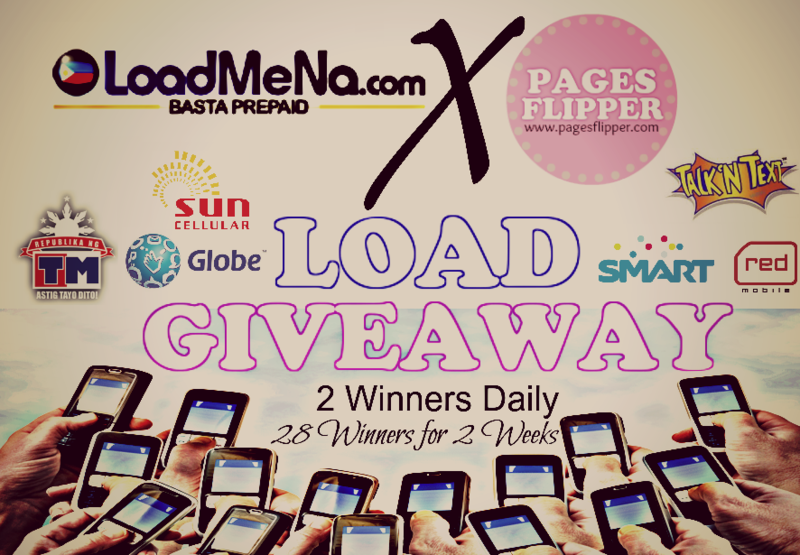 Now to ease a little burden on your pockets and in partnership with LoadMeNa.com, we are serving you a Load Giveaway to any provider around the country. All you have to do is to do it all. Comment below your Facebook Name, Twitter ID and the Email you register on LoadMeNa.com. Answer why you deserve to win a load from us? Above mechanics are mandatory as stated for you to eligibly win on our daily giveaway on Facebook. Failure to comply above instructions may lead to your entries disqualifications. Share our official photo on Facebook and share it to your friends. Post it as a status and don't forget to mention LoadMeNa.com and Pages Flipper; tag 5 facebook friends as well. Your shared post must appear on our facebook page for us to easily track your entries. More shares means more chances of winning. Click here for our official photo: Share Me! Do Mechanics 01 and Mechanics 02 correctly. We will pick 2 winners daily for the next 2 weeks. Do Mechanics 01 once for the whole duration of the contest but you have to do Mechanics 02 daily and as much as you can. Announcement of Winners will be on every 10pm starting tomorrow January 22, 2013 and so on. Again, the contest will last 2 weeks. More entries, more chances of winning! That's it! Good luck everyone.